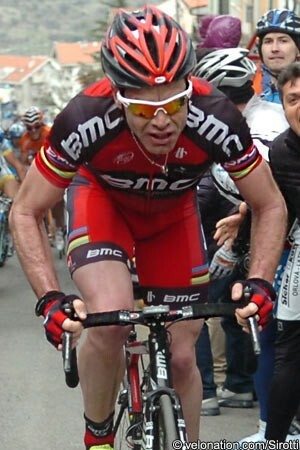 Cadel Evans (BMC Racing) put the slight disappointment of the previous day’s prologue performance with victory in the first road stage of the Critérium du Dauphiné, between Seyssins and Saint-Vallier. The Tour de France champion was the fastest of a three-man breakaway, which escaped with less than five kilometres of the 187km stage remaining. The Australian led the trio into the finishing straight and managed to hold off the attentions of Jérôme Coppel (Saur-Sojasun), whose attack had started the move, with Andrey Kashechkin (Astana) taking third. “It was a technical descent, quite narrow as well,” explained Evans afterwards. “I saw an opportunity there to go clear of the peloton. You have to try something when you’re in that situation. “This shows that the work I’ve done at training has been good but there’s still a lot of work to be done until the Tour de France,” he added. Nacer Bouhanni (FDJ-BigMat) led the peloton across the line just four seconds behind them. Prologue winner Luke Durbridge (Orica-GreenEdge) was in a group 27 seconds back, which meant that British champion Bradley Wiggins (Team Sky) took over the race lead, with Evans a single second behind him. The stage was characterised by a long distance break from Giovanni Bernaudeau (Europcar), Markel Irizar (RadioShack-Nissan), Nicolas Edet (Cofidis), Maarten Tjallingii (Rabobank), Sep Vanmarcke (Garmin-Barracuda) and Japanese champion Yukihiro Doi (Argos-Shimano). The six riders managed to build a maximum lead of more than 13 minutes before the peloton began to close them down; Doi and Bernadeau were the first to be dropped, followed by Tjallingii on the final climb of the day with just over ten kilometres to go, and Irizar tried to go it alone shortly afterwards. The Spanish rider was just a few seconds clear as he rode over the top, with just nine kilometres to go, however, and was caught as a series of attacks were launched from the front of the peloton on the descent. The last of these came from Rolland, Kashechkin and Evans, which managed to stay away to the finish. The jagged-profiled stage featured three 4th, two 3rd and one 2nd category climb, but it was the 3rd category Côte de la Sizeranne, which would top out with just nine kilometres to go, that was likely to be the most important of all. Bernaudeau, Irizar, Edet and Tjallingii escaped after just four kilometres, and were quickly joined by Vanmarcke and Doi. They were quickly allowed to open up a huge lead over the peloton, which reached 13’10” after 45km, as Lotto-Belisol calmly led behind them. As the headwind switched to a crosswind however, the pace of the peloton lifted and the gap began to fall sharply. After 47km though, an innocuous looking crash brought down Pierrick Fédrigo (FDJ-BigMat) and Samuel Sánchez (Euskaltel-Euskadi); the Frenchman was soon back in the peloton - although he paid a visit to the doctor’s car with a pain in his knee - but the Olympic champion was unable to rejoin, apparently suffering with suspected broken ribs. Euskaltel-Euskadi teammates Ricardo Garcia and Peio Bilbao dropped back to help Sánchez, but over the top of the 3rd category Côte de Chambaran after 90.5km, he was 6’45” behind. Saur-Sojasun, Team Sky, Orica-GreenEdge and BMC Racing all came forward to join Lotto-Belisol and the gap to the leaders steadily closed and, with 50km to go, it was down to just three minutes. On the 4th category climb of the Côte de Potences with 37km to go, as Bernadeau took the points over the top - as he had done on every other climb so far - BMC Racing moved forward in force. Inside the final 30km a crash towards the back of the peloton saw half a dozen riders come down, including Australian and Dutch champions Simon Gerrans (Orica-GreenEdge) and Pim Ligthart (Vacansoleil-DCM). Dan Martin (Garmin-Barracuda) looked to be the most seriously affected, and the race ambulance briefly stopped beside him, but the Irishman was eventually up and riding again. Once the riders had regrouped at the rear of the peloton, Omega Pharma-Quick Step came to the front and began to shut the break down. The gap finally dropped below two minutes as the leaders entered the final 20km. As they entered the final 15km the spirit of co-operation between the six leaders began to evaporate and, mostly under the impetus of Tjallingii and Irizar, Bernadeau and Doi were dropped. With 12km to go though, the four remaining leaders were less than a minute behind, as they approached the foot of the final climb. Omega Pharma-Quick Step was still leading, with almost its entire team lined up on the front, and riders began to splinter off the back. With a kilometre still to climb Tjallingii, Irizar, Vanmarcke and Edet were little more than 30 seconds clear, as the Dutchman was dropped. Meanwhile, at the back of the peloton, Andy Schleck (RadioShack-Nissan) was among those to lose contact, along with Alexandre Vinokourov (Astana). As the top approached Irizar struck out alone, while behind him, Pierre Rolland (Europcar) bridged across to Vanmarcke and Edet, and passed them as they crossed the summit. As the peloton caught Tjallingii, Rabobank teammate Luis León Sánchez attacked, along with Philippe Gilbert (BMC Racing); they quickly caught up with Rolland, but had the peloton on their heels. Rolland’s Europcar teammate Cyril Gautier counterattacked and got a small gap, but the front of the peloton was just behind him. Irizar was just a few seconds clear now, as he almost left the road on a sharp bend. Gautier did the same, just behind him, as the front of the peloton streamed past him. Finally, with five kilometres to go, Irizar was caught by the front of the peloton, and there was an immediate attack from Jérôme Coppel (Saur-Sojasun). He was joined by Andrei Kashechkin (Astana) and Tour de France champion Cadel Evans (BMC Racing), and they pulled a few seconds clear of the fractured bunch. Omega Pharma-Quick Step was leading the pursuit, but under the flamme rouge the trio was still five seconds clear. Evans was leading but, as they entered the final two hundred metres Coppel tried to come around him to take the stage; the Australian managed to hold the Frenchman off however, to take victory by a wheel. The group containing Schleck and Vinokourov came in some 3’10” behind, while Dan Martin crossed the line alone after 16’39”; Sánchez limped home with Bilbao and Garcia 23’54” later, and was a serious doubt for stage two. FRA 2 Jérome Coppel (Saur - Sojasun) s.t. KAZ 3 Andrey Kashechkin (Astana Pro Team) s.t. FRA 5 Tony Gallopin (RadioShack - Nissan) s.t. SLO 6 Borut Bozic (Astana Pro Team) s.t. GER 7 Gerald Ciolek (Omega Pharma - Quickstep) s.t. FRA 8 Julien Simon (Saur - Sojasun) s.t. ITA 9 Daniele Ratto (Liquigas - Cannondale) s.t. NOR 10 Edvald Boasson Hagen (Sky Procycling) s.t. GER 11 Dominik Nerz (Liquigas - Cannondale) s.t. UKR 12 Andriy Grivko (Astana Pro Team) s.t. ESP 13 Daniel Moreno Fernandéz (Katusha Team) s.t. GER 14 Paul Martens (Rabobank Cycling Team) s.t. GBR 15 David Millar (Garmin - Barracuda) s.t. ITA 16 Rinaldo Nocentini (Ag2R - La Mondiale) s.t. ESP 17 Luis Leon Sanchez Gil (Rabobank Cycling Team) s.t. ITA 19 Matteo Carrara (Vacansoleil - DCM Pro Cycling Team) s.t. BEL 20 Jelle Vanendert (Lotto - Belisol Team) s.t. POR 21 Bruno Manuel Silva Pires (Team Saxo Bank) s.t. COL 23 Leonardo Fabio Duque (Cofidis - Le Credit En Ligne) s.t. NED 24 Rob Ruijgh (Vacansoleil - DCM Pro Cycling Team) s.t. FRA 25 Mickael Cherel (Ag2R - La Mondiale) s.t. FRA 26 Sylvain Chavanel (Omega Pharma - Quickstep) s.t. USA 27 George Hincapie (BMC Racing Team) s.t. BLR 28 Kanstantsin Siutsou (Sky Procycling) s.t. FRA 29 Fabrice Jeandesboz (Saur - Sojasun) s.t. ESP 30 Xavier Florencio (Katusha Team) s.t. FRA 31 Thomas Voeckler (Europcar) s.t. FRA 32 Christophe Le Mevel (Garmin - Barracuda) s.t. ESP 33 Egoi Martinez De Esteban (Euskaltel - Euskadi) s.t. BEL 34 Philippe Gilbert (BMC Racing Team) s.t. FRA 35 Alexandre Geniez (Argos-Shimano) s.t. FRA 37 Cyril Lemoine (Saur - Sojasun) s.t. CRC 38 Andrey Amador Bakkazakova (Movistar Team) s.t. FRA 39 Cyril Gautier (Europcar) s.t. NED 40 Bram Tankink (Rabobank Cycling Team) s.t. FRA 41 Yoann Bagot (Cofidis - Le Credit En Ligne) s.t. GER 42 Tony Martin (Omega Pharma - Quickstep) s.t. BRA 43 Murilo Antonio Fischer (Garmin - Barracuda) s.t. ESP 44 Haimar Zubeldia Agirre (RadioShack - Nissan) s.t. AUT 45 Stefan Denifl (Vacansoleil - DCM Pro Cycling Team) s.t. FRA 46 Jean-christophe Peraud (Ag2R - La Mondiale) s.t. ESP 47 Carlos Barredo Llamazales (Rabobank Cycling Team) s.t. ESP 48 Luis Angel Mate Mardones (Cofidis - Le Credit En Ligne) s.t. FRA 49 Arthur Vichot (Equipe Cycliste FDJ - BigMat) s.t. ESP 50 Daniel Navarro Garcia (Team Saxo Bank) s.t. ESP 51 Gorka Verdugo Marcotegui (Euskaltel - Euskadi) s.t. USA 52 Tejay Van Garderen (BMC Racing Team) s.t. ITA 53 Vincenzo Nibali (Liquigas - Cannondale) s.t. UKR 54 Yaroslav Popovych (RadioShack - Nissan) s.t. AUS 55 Richie Porte (Sky Procycling) s.t. BLR 56 Vasil Kiryienka (Movistar Team) s.t. FRA 57 Blel Kadri (Ag2R - La Mondiale) s.t. SLO 58 Kristjan Koren (Liquigas - Cannondale) s.t. FRA 60 Pierre Rolland (Europcar) s.t. GBR 61 Bradley Wiggins (Sky Procycling) s.t. BEL 62 Kevin De Weert (Omega Pharma - Quickstep) s.t. ESP 63 Mikel Landa Meana (Euskaltel - Euskadi) s.t. FRA 64 Brice Feillu (Saur - Sojasun) s.t. AUS 65 Michael Rogers (Sky Procycling) s.t. FRA 66 Anthony Delaplace (Saur - Sojasun) s.t. NED 67 Pieter Weening (Orica - GreenEDGE) s.t. ESP 68 Markel Irizar Aranburu (RadioShack - Nissan) s.t. FRA 69 Rémy Di Gregorio (Cofidis - Le Credit En Ligne) s.t. RUS 70 Eduard Vorganov (Katusha Team) s.t. GER 71 Christian Knees (Sky Procycling) s.t. NED 72 Wilco Kelderman (Rabobank Cycling Team) s.t. FRA 73 Arnaud Gerard (Equipe Cycliste FDJ - BigMat) s.t. ESP 74 Ruben Plaza Molina (Movistar Team) s.t. POR 75 Tiago Machado (RadioShack - Nissan) s.t. FRA 76 Guillaume Levarlet (Saur - Sojasun) s.t. FRA 77 Rémi Pauriol (Equipe Cycliste FDJ - BigMat) s.t. FRA 78 Maxime Bouet (Ag2R - La Mondiale) s.t. BEL 79 Dries Devenyns (Omega Pharma - Quickstep) s.t. GBR 80 Christopher Froome (Sky Procycling) s.t. EST 81 Rein Taaramäe (Cofidis - Le Credit En Ligne) s.t. COL 82 Alexander Rojas () s.t. DEN 83 Nicki Sørensen (Team Saxo Bank) s.t. RUS 84 Denis Menchov (Katusha Team) s.t. RUS 85 Egor Silin (Astana Pro Team) s.t. FRA 86 Matthieu Ladagnous (Equipe Cycliste FDJ - BigMat) s.t. ESP 87 Alberto Losada Alguacil (Katusha Team) s.t. FRA 88 Maxime Mederel (Saur - Sojasun) s.t. FRA 89 Anthony Charteau (Europcar) s.t. AUS 91 David Tanner (Team Saxo Bank) s.t. FRA 92 Christophe Kern (Europcar) s.t. AUS 93 Michael Matthews (Rabobank Cycling Team) s.t. ITA 94 Alessandro Vanotti (Liquigas - Cannondale) s.t. BEL 95 Gert Dockx (Lotto - Belisol Team) s.t. AUS 96 Luke Durbridge (Orica - GreenEDGE) s.t. FRA 98 Arnold Jeannesson (Equipe Cycliste FDJ - BigMat) s.t. KAZ 99 Dmitriy Fofonov (Astana Pro Team) s.t. SUI 100 Michael Schar (BMC Racing Team) s.t. FRA 101 David Moncoutié (Cofidis - Le Credit En Ligne) s.t. KAZ 102 Maxim Iglinskiy (Astana Pro Team) s.t. POL 103 Maciej Paterski (Liquigas - Cannondale) s.t. FRA 104 Amaël Moinard (BMC Racing Team) s.t. RUS 106 Petr Ignatenko (Katusha Team) s.t. ESP 107 David Lopez Garcia (Movistar Team) s.t. FRA 108 Kevin Reza (Europcar) s.t. FRA 109 Jérome Pineau (Omega Pharma - Quickstep) s.t. ESP 110 Jesús Hernández Blazquez (Team Saxo Bank) s.t. FRA 111 Nicolas Edet (Cofidis - Le Credit En Ligne) s.t. FRA 113 Sébastien Hinault (Ag2R - La Mondiale) s.t. RUS 114 Yuri Trofimov (Katusha Team) s.t. COL 115 Jose Cayetano Sarmiento Tunarrosa (Liquigas - Cannondale) s.t. ITA 116 Federico Canuti (Liquigas - Cannondale) s.t. ITA 117 Davide Malacarne (Europcar) s.t. ITA 119 Daniele Pietropolli (Lampre - ISD) s.t. GER 120 Simon Geschke (Argos-Shimano) s.t. ITA 121 Davide Cimolai (Lampre - ISD) s.t. ESP 122 Jorge Azanza Soto (Euskaltel - Euskadi) s.t. AUS 125 Matthew Lloyd (Lampre - ISD) s.t. NED 127 Pim Ligthart (Vacansoleil - DCM Pro Cycling Team) s.t. BEL 128 Sep Vanmarcke (Garmin - Barracuda) s.t. GER 130 John Degenkolb (Argos-Shimano) s.t. FRA 131 Thierry Hupond (Argos-Shimano) s.t. FRA 132 Matthieu Sprick (Argos-Shimano) s.t. FRA 133 Yuriy Krivtsov (Lampre - ISD) s.t. UKR 134 Oleksandr Kvachuk (Lampre - ISD) s.t. UKR 135 Denys Kostyuk (Lampre - ISD) s.t. NZL 136 Hayden Roulston (RadioShack - Nissan) s.t. KAZ 137 Alexandre Vinokourov (Astana Pro Team) s.t. LUX 138 Andy Schleck (RadioShack - Nissan) s.t. NED 139 Michel Kreder (Garmin - Barracuda) s.t. NED 140 Bert-jan Lindeman (Vacansoleil - DCM Pro Cycling Team) s.t. ESP 141 Koldo Fernández De Larrea (Garmin - Barracuda) s.t. ARG 142 Juan Jose Haedo (Team Saxo Bank) s.t. AUS 143 Jonathan Cantwell (Team Saxo Bank) s.t. ERI 144 Daniel Teklehaymanot (Orica - GreenEDGE) s.t. DEN 145 Kasper Larsen Klostergaard (Team Saxo Bank) s.t. FRA 146 Christophe Riblon (Ag2R - La Mondiale) s.t. BEL 147 Stijn Devolder (Vacansoleil - DCM Pro Cycling Team) s.t. ESP 148 David Arroyo Duran (Movistar Team) s.t. BEL 149 Tosh Van Der Sande (Lotto - Belisol Team) s.t. BEL 150 Frederik Willems (Lotto - Belisol Team) s.t. SUI 151 Steve Morabito (BMC Racing Team) s.t. ITA 152 Manuel Quinziato (BMC Racing Team) s.t. FRA 153 Sylvain Georges (Ag2R - La Mondiale) s.t. AUS 154 Wesley Sulzberger (Orica - GreenEDGE) s.t. AUS 155 Simon Clarke (Orica - GreenEDGE) s.t. NED 157 Lieuwe Westra (Vacansoleil - DCM Pro Cycling Team) s.t. FRA 158 Giovanni Bernaudeau (Europcar) s.t. NED 159 Jos Van Emden (Rabobank Cycling Team) s.t. BEL 161 Sebastien Rosseler (Garmin - Barracuda) s.t. BEL 162 Kenny Dehaes (Lotto - Belisol Team) s.t. BEL 163 Maarten Neyens (Lotto - Belisol Team) s.t. BEL 164 Jurgen Van De Walle (Lotto - Belisol Team) s.t. FRA 165 Pierrick Fedrigo (Equipe Cycliste FDJ - BigMat) s.t. GER 166 Bert Grabsch (Omega Pharma - Quickstep) s.t. GER 168 Roger Kluge (Argos-Shimano) s.t. AUS 169 Adam Leigh Howard (Orica - GreenEDGE) s.t. ESP 174 Pello Bilbao Lopez De Armienta (Euskaltel - Euskadi) s.t. ESP 175 Samuel Sanchez Gonzalez (Euskaltel - Euskadi) s.t. GER 13 Gerald Ciolek (Omega Pharma - Quickstep) s.t. ESP 14 Markel Irizar Aranburu (RadioShack - Nissan) s.t. ESP 16 Luis Leon Sanchez Gil (Rabobank Cycling Team) s.t. FRA 17 Cyril Lemoine (Saur - Sojasun) s.t. NED 18 Bram Tankink (Rabobank Cycling Team) s.t. ITA 19 Vincenzo Nibali (Liquigas - Cannondale) s.t. AUS 20 Michael Rogers (Sky Procycling) s.t. BEL 22 Jurgen Van Den Broeck (Lotto - Belisol Team) s.t. ESP 23 Ruben Plaza Molina (Movistar Team) s.t. FRA 25 Arnaud Gerard (Equipe Cycliste FDJ - BigMat) s.t. USA 26 Tejay Van Garderen (BMC Racing Team) s.t. NED 27 Pieter Weening (Orica - GreenEDGE) s.t. FRA 29 Tony Gallopin (RadioShack - Nissan) s.t. BEL 30 Philippe Gilbert (BMC Racing Team) s.t. RUS 32 Egor Silin (Astana Pro Team) s.t. RUS 33 Denis Menchov (Katusha Team) s.t. USA 35 George Hincapie (BMC Racing Team) s.t. GBR 37 Christopher Froome (Sky Procycling) s.t. FRA 38 Alexandre Geniez (Argos-Shimano) s.t. COL 42 Alexander Rojas () s.t. ESP 43 Gorka Verdugo Marcotegui (Euskaltel - Euskadi) s.t. KAZ 46 Andrey Kashechkin (Astana Pro Team) s.t. NED 48 Wilco Kelderman (Rabobank Cycling Team) s.t. FRA 50 Rémi Pauriol (Equipe Cycliste FDJ - BigMat) s.t. FRA 52 Julien Simon (Saur - Sojasun) s.t. GER 53 Christian Knees (Sky Procycling) s.t. AUS 54 Luke Durbridge (Orica - GreenEDGE) s.t. ESP 58 Juan Jose Cobo Acebo (Movistar Team) s.t. ESP 61 Alberto Losada Alguacil (Katusha Team) s.t. FRA 62 Maxime Bouet (Ag2R - La Mondiale) s.t. ESP 63 Daniel Moreno Fernandéz (Katusha Team) s.t. FRA 66 Guillaume Levarlet (Saur - Sojasun) s.t. ITA 67 Simone Stortoni (Lampre - ISD) s.t. FRA 68 Anthony Delaplace (Saur - Sojasun) s.t. FRA 70 Brice Feillu (Saur - Sojasun) s.t. FRA 72 Cyril Gautier (Europcar) s.t. GER 73 Dominik Nerz (Liquigas - Cannondale) s.t. RUS 74 Eduard Vorganov (Katusha Team) s.t. BEL 77 Kevin De Weert (Omega Pharma - Quickstep) s.t. ITA 78 Daniele Ratto (Liquigas - Cannondale) s.t. AUS 82 Michael Matthews (Rabobank Cycling Team) s.t. ITA 84 Matteo Carrara (Vacansoleil - DCM Pro Cycling Team) s.t. FRA 87 Christophe Kern (Europcar) s.t. FRA 88 Arthur Vichot (Equipe Cycliste FDJ - BigMat) s.t. FRA 90 Amaël Moinard (BMC Racing Team) s.t. ESP 92 Xavier Florencio (Katusha Team) s.t. ESP 94 Mikel Landa Meana (Euskaltel - Euskadi) s.t. SUI 98 Michael Schar (BMC Racing Team) s.t. FRA 100 David Moncoutié (Cofidis - Le Credit En Ligne) s.t. RUS 105 Petr Ignatenko (Katusha Team) s.t. ESP 111 Jesús Hernández Blazquez (Team Saxo Bank) s.t. COL 113 Jose Cayetano Sarmiento Tunarrosa (Liquigas - Cannondale) s.t. BEL 115 Frederik Veuchelen (Vacansoleil - DCM Pro Cycling Team) s.t. ITA 121 Daniele Pietropolli (Lampre - ISD) s.t. NED 142 Michel Kreder (Garmin - Barracuda) s.t. ITA 143 Manuel Quinziato (BMC Racing Team) s.t. NED 145 Bert-jan Lindeman (Vacansoleil - DCM Pro Cycling Team) s.t. UKR 149 Oleksandr Kvachuk (Lampre - ISD) s.t. UKR 153 Denys Kostyuk (Lampre - ISD) s.t.